Diana Rattray. The Spruce Eats, 2010. This potluck pasta wheel casserole is filled with flavor, with chicken, ham, mushrooms, and two kinds of cheese. It's best served with a simple green salad or sliced fresh tomatoes and biscuits or rolls. 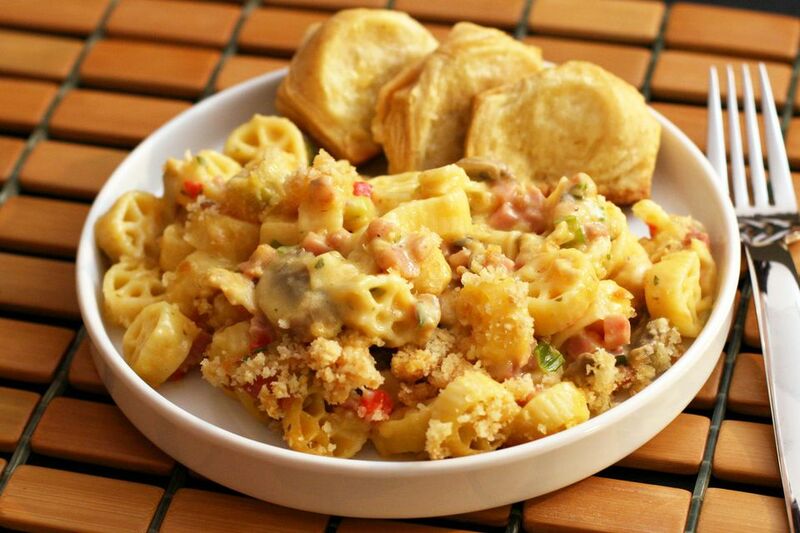 A thickened cheese sauce brings the chicken and ham together in this tasty pasta casserole. 8 ounces pasta, macaroni, mini penne, mini wagon wheels, etc. Lightly grease a 2 1/2 to 3-quart baking dish. Cook the pasta in boiling salted water following package directions. Drain in a colander and rinse with hot water. Set aside. In a large saucepan, melt 3 tablespoons of butter over medium-low heat. Add the chicken, Creole seasoning, mushrooms, and ham. Cook, stirring until chicken is cooked through and mushrooms are tender. Add the pimiento, green onions, and parsley and cook, stirring, for about 1 minute. Stir in flour until well blended. Add chicken broth and milk. Cook, stirring, until thickened. Add the Cheddar and American cheeses, along with salt and pepper, to taste. Stir to blend. Combine with the drained pasta and spoon into the prepared baking dish. Melt the remaining 1 tablespoon of melted butter and toss that in with the bread crumbs; sprinkle evenly over the casserole. Bake the casserole for about 25 minutes, or until it's browned, and bubbly.